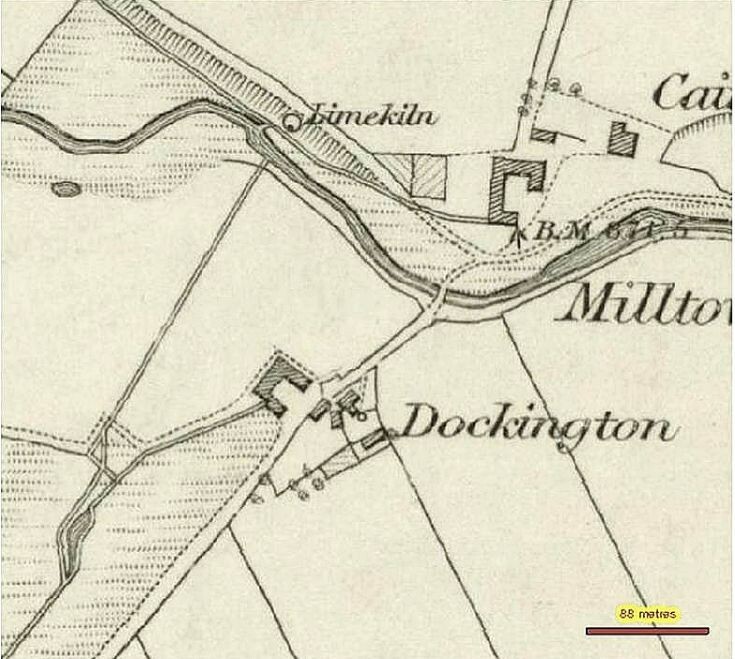 If you take the left fork at the Milton and follow the road to the Old Glenbuchat Kirk you pass through Dockington farm. It is still a farm today and in the above map of 1850 there was the farm cottage on the left and the farm buildings on the right as is the case today. This raises the possibility that at some time in the past this may have been some type of ale house. Near the base of Ben Newe there used to be a Peter Fair, so there may besome connection with this name. The first mention of an occupant was William Chruie born 1709. It is stated that he was born in Dockington but it is unclear whether it was him or his wife who was born there. The Chruie family became the Chree family who lived at Sunnybrae and had a great influence on the life of the Glen in later generations. d. October 30, 1831, Glencorny. The Imperial Dictionary gives "Oxgang. As much land as an ox would plough in a year, generally from 15 to 20 acres. . . . In Scotland it is termed Oxgate." L-R, Back, William Thomson, Belnaglack; George Cameron, Sunnybrae; John Murdoch, Belnaboth; Alex Thom, Tombreck; George Thomson, Drumnagarrow; William Henderson, Easter Buchat; William Stuart, Smiddyford; Pat Thomson, Mains. Middle, Alex Findlay (invitation judge), Ledmacoy; Alex Macgregor (piping judge), Little Tolly; George Duncan, Easter Buchat; John Murdoch Sr., Belnaboth; James Thomson, Mains. Front, Alex Hay, Deochry; Alex Stuart, Blackhillock; John Johnston, Beltimb; William Murdoch, Milton. cause: Debility, old age. As certified by P Howie M.B.C.M. Another famous Dockington family is the Reid family. Sacred to the memory of Archibald Reid farmer Dockington Glenbucket born 29th May 1797 died 11th January 1873 and of his children Sophia born 9th June 1859 died 26th July 1860. Isabella born 29th November 1862 died 3rd December 1862 and of his wife Isabell McHardy who died at Balquham 10th October 1889 aged 62 years. Eldest son of Archibald Reid, farmer, Glenbuchat, and Isabella McHardy, his wife. Born at Glenbuchat, 22nd December, 1855. M.A. (graduated as William Reid), Aberd., 1875. App. to Alexander Cochran and George Anderson (Cochran & Anderson). Sometime in partnership with Robert Downie Leslie (1876), firm being Leslie & Reid ; thereafter with James Bisset Davidson, solicitor, firm being Reid & Davidson. Promoter, Hon. Secretary and subsequently Vice President of the Aberdeen Liberal Unionist Association. Captain, 4th August, 1888, retiring 4th April, 1894. Managing Director, John Begg (Limited), Distillers. Licen. by Presb. of Garioch 27th April 1878; assistant at Holburn, Aberdeen ; ord. 27th April 1879.
d. 07 Jan 1935, Chesley, Walkerton, On, Can. 1861: Employed as Miller in Glenbucket (1861 census). 1865: Resident at Mill of Glenbucket at time of marriage. Elsie was Robert BREMNER's second cousin. (Marriage certificate). 1891:Widowed, lived with children in Chesley Village, Bruce North, On. Sandy, George, Ella nee Thomson (Bowiebank & Dockington) & Gordon Johnston (Milton) at Glen kirk. 1955. William Thomson jnr, John & Janet Johnston in church door.